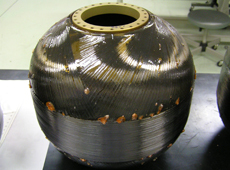 Q. Solid-fuel rockets are said to be more difficult to guide and control compared to liquid-fuel rockets. What is you opinion on this? With liquid-fuel rockets, it is possible to stop the engine and still control the thrust after launch. But with solid-fuel rockets, the engine cannot be stopped in mid-course once it is ignited. This is why solid rockets are said to be difficult to guide and control. But this does not mean they have poor accuracy in guidance and control. To control the orbit of a satellite, you have to acquire information on its location and velocity at a given point. The location is determined based on the three spatial dimensions - for example, latitude, longitude and altitude. The three-dimensional information also includes the speed at each dimension, so the velocity is also three-dimensional information. With these six coordinates - three for location and three for velocity, we can determine the orbit of a satellite. The engine burn of a solid-fuel rocket cannot be stopped, which means it is impossible to adjust for all six coordinates to meet the needs of a satellite. So the question is, what can we do? Each satellite or planetary exploration spacecraft has its own specific coordinates that take precedence, so we just focus on those. 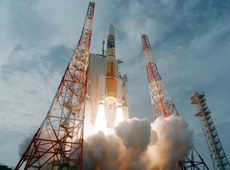 For example, the solar physics satellite Hinode was launched into Sun-synchronous orbit to travel in a north-south direction above the Earth. What was important in that case was the relationship between the angle of inclination of the orbital plane to the equatorial plane, and the height of the apogee - the height where the satellite is farthest from Earth. As long as we can ensure that the correlation of these two parameters corresponds, a satellite can be launched into its desired orbit. However, to achieve this, the satellite developer has to have a good understanding of the performance of the rocket, and the rocket developer has to have a good understanding of the performance of the satellite. At the Institute of Space and Astronautical Science/JAXA, rocket developers and satellite developers work in the same building, so we can solve problems by dropping in on each other and asking for advice. But we also would like university professors who don’t know very much about rockets to become users of the Epsilon launch vehicle. So our plan is to install a small liquid-fuel engine, which was used to control the attitude of the M-V launch vehicle, on Epsilon’s third stage. 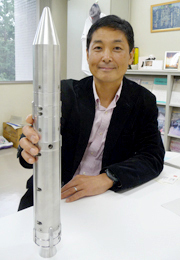 This will enable orbit insertion with similar accuracy to a liquid-fuel rocket. If access to space becomes easier, there will be more rocket users. With the Epsilon launch vehicle, we would like to greatly lower the barriers for reaching space. Q. What do you pay special attention to in improving the reliability of launch vehicles? 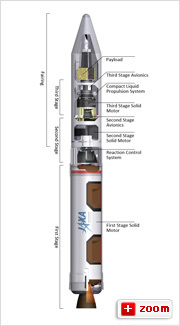 The Epsilon launch vehicle uses upgraded versions of technology used in the M-V and H-IIA rockets. So because these are tried-and-true components, the development of the Epsilon began with guaranteed reliability. And with the addition of artificial intelligence, I believe that the rocket’s reliability will keep growing. Applying artificial intelligence is not just about installing a sophisticated electronic brain; we will also implant our know-how. For example, in rockets orbit is controlled with a nozzle that expels combustion gas: orbit deviation is corrected by changing the direction of the nozzle. The nozzle is controlled with electricity, and by looking at the corrugated pattern of the electric current, we can tell if it’s moving correctly. The corrugated pattern is equivalent to an electrocardiogram of our bodies, and it is very much like checking the heart of a rocket. Everything we know about how to use this pattern to judge normality or abnormality will be implanted in the rocket. More precisely, we will create a thorough list of how malfunctions of each component would impact the rocket overall, and implant that information into its artificial-intelligence "brain." Through this process we can also clarify which parts have to be built particularly tough and it will enhance the rocket’s reliability. Q. What is the current development status of the Epsilon Launch Vehicle? Demonstration using two desktop computers. The left screen monitors the state of the rocket, and the right screen carries out checks. We are now in the final stage of design, moving towards the launch of the first Epsilon rocket in 2013. We have made models of the hardware components, and are testing them one by one. 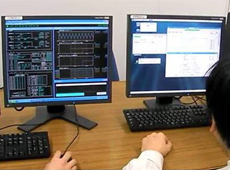 The rocket launch control and autonomous-check systems, which use two desktop computers, have been verified with the actual hardware. We are using a desktop at the moment, but eventually we’d like to be able to use a laptop. As for the motor case, which no longer requires an autoclave for manufacturing, we have built a small carbon fiber prototype and are testing it now. We have been able to confirm that it is possible to make a lighter and stronger motor case, so we plan to make a full-size model to test in the next two years. Q. What do you think is the key development agenda? Because the autonomous-check and mobile launch control system are new elements, they are probably people’s biggest concerns, and we understand that with these we can least afford to fail. Needless to say, using artificial intelligence in the rocket is something that is only possible based on achievements made to this point. However, these achievements are in people’s heads and not written in manuals. People have put what they have in their heads on the line for real-life performance. But now, it is important to sort it out systematically and compile a database. That is, I think that a key to this development is to sort out and systematize the foundation of what we have achieved to date, and make the knowledge usable. It may be an overstatement to say that we are over the hump, but we have been able to verify the possibility of mobile launch control using a prototype model. So I think that we are coming close to the stage where we can build a reliable launch vehicle and finish production in time for launch in 2013. Q. What has been the reaction of people around you towards the Epsilon launch vehicle? At first, when we talked about the Epsilon launch vehicle at conferences and so on, the majority of responses were that such a mobile launch control system would be impossible. However, last year, the project was covered in the U.S. magazine Aviation Week & Space Technology. And since the publication of photos of the test we ran using two desktop computers to control the launch process, I have the impression that those who had hadn’t taken our project seriously are changing their mind. However, the confidence of my colleagues who are working on the project is much more important to me than other people’s worrying. I have a strong sense that the bond between us has grown tighter since development started three years ago. Back then, some of us were still feeling uncertain about whether one or two computers would do, but today everyone is working with faith and confidence. I think all the developers have a very strong determination to succeed with the Epsilon launch vehicle. If our mobile launch control system works, it will be the most advanced technology in the field by far. So in that sense I think this is a big opportunity.